I have been travelling a lot lately, since the beginning of February I've driven just short of 8,000 km's (or 4970 miles). This has meant little time for stitching (or other crafting) because I have been on the road 4 or 5 days a week. To put it into context, if I had not needed to be home by 3pm everyday to pick Mr W up from school, I could have travelled this route with those same kilometres. Yes that is about 65% of the road distance (staying as close to the coast as possible) around Australia. 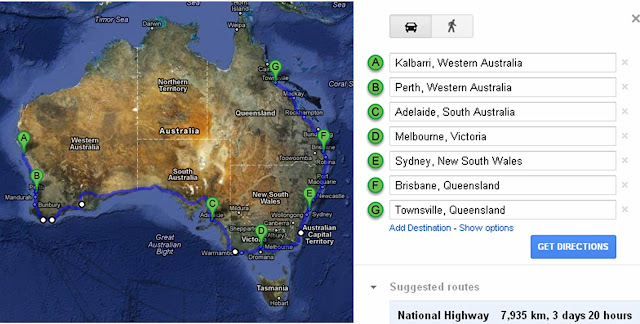 Put another way, I could have travelled from Perth to Sydney and back and still had about 100km's to spare. The good news is I met my kilometre requirement for the FBT year and DH doesn't need to a pay a penalty of $3,500 in tax. I know you've all heard the Johnny Cash version of I've been everywhere man, but have you heard the Aussie version? Bigpond has used this song for several years to advertise their Internet services in Australia.